The RTS-1 (Research Test Series 1), also known as MIDAS-RTS-1 or AFP-461, was an extension to the MIDAS program of early warning satellites. The Aerojet payload in this series, however, would be designed specifically to detect, in real-time, lower-radiance sea-launched ballistic missiles (SLBMs) and medium-range ballistic missiles (MRBMs), and be capable of determining their launch locations, on two sightings, within a range of 8-to-1O nm, The radiant characteristics of all of the missiles detected around the world also would be identified, measured, and catalogued. Aerojet, now an Air Force Associate Contractor instead of a subcontractor to Lockheed, designed an improved infrared payload for the RTS-1 vehicles. It consisted of a Bouwers 8-inch aperture concentric telescope, improved spectral filters, and 442 lead sulfide detectors. These detectors, smaller than earlier versions, were compatible with an optical image quality of 30 seconds arc. Because of the increased number of channels, Lockheed and Aerojet introduced a multiplexer to the payload side of the slip ring; thus reducing substantially the number of mechanical crossings of the spin table. Two star sensors were also added to improve attitude information. As before, the payload rotated on its spin table at 6 rpm, and had a maximum slant range of 4200 miles at 2000 nm altitude. Once again the Lockheed spacecraft were to be placed in circular polar orbits at 2000 nm, but now possessed a reliability of six months operational lifetime. The upper stage Agena booster-satellite used in this instance was the Agena-D, a standardized Agena, that employed an improved rocket engine, common components tried and proved in other flight projects, and increased redundant features. Size and mass resembled the Agena-B. Power requirements for a six-month life, however, accounted for a significant physical difference. This Agena carried four solar arrays positioned for maximum sun intercept in all seasons: two fixed to the aft rack, as before, and two fixed to the forward rack, just aft of the infrared payload. The RTS-1 1 MIDAS satellite had been launched from Vandenberg AFB on 9 June 1966. Agena's Bell rocket engine failed to ignite for its second burn and, instead of a 2000 nm circular polar orbit, the satellite remained in a highly elliptical parking orbit with a perigee of 108 nm and an apogee of 2,246 nm. Worse, the Agena tumbled and its attitude control gas quickly exhausted. No useful tests of the infrared payload could be performed, and a few months later, on 3 December 1966, the satellite dipped into the Earth's lower atmosphere over Australia and incinerated. Launch of the last two MIDAS satellites followed rapidly. The RTS-1 2 and RTS-1 3 vehicles rose from Vandenberg AFB on 19 August and 5 October 1966, achieved the intended circular polar orbits, and operated successfully for 11 and 12 months, respectively, easily exceeding the six-month MTTF lifetime planned for them. During this period these two spacecraft also detected all Soviet and U.S. ballistic missiles launched within their field of view-139 rocket launches-and identified four Soviet launch sites. This accomplishment was secured in the face of global cloud cover once thought to preclude space-borne missile defense alarm. 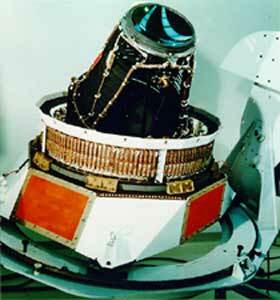 A follow-on RTS-2 series was planned to use the geostationary orbit. This series evolved into the operational DSP (Defense Support Program).